Stewart Drive is a popular residential area within easy reach of Irvine Town Centre. Number 13 is a three-bedroom mid terraced house with spacious accommodation and off-street parking to the front. An extension has created a larger than normal kitchen, utility area and en-suite shower room for the downstairs bedroom. The accommodation comprises of entrance hallway, lounge with box bay window and feature fire, spacious dining kitchen, utility room, downstairs bedroom and en-suite shower room. The upper level has a further two bedrooms and a shower room. All bedrooms are double sized and have useful storage cupboards. Externally the property has gardens to the front and rear. The rear garden is enclosed by wall and timber fencing and is mainly slabbed for low maintenance. There is a brick store. The front garden is chipped and a slabbed area provides off street parking. 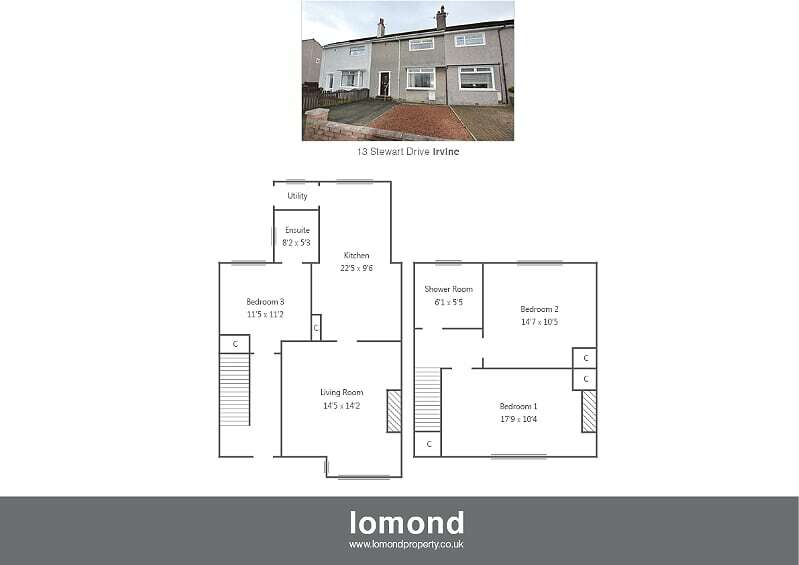 Stewart Drive is a sought-after location within easy reach of Irvine Town Centre. There are many amenities nearby such as shops, bus stop and doctor’s surgery. There is a local bus service to the town centre as well as other areas in Irvine. Irvine has good bus and train services to other Ayrshire towns as well as Glasgow. From Lomonds office continue along Bank Street and take the third left onto Stewart Drive. The property can be found at the bottom of the street on the left hand side.